December 2nd, 1805 at Austerlitz (now Slavkov), eight kilometers east of Brno, Moravia (today Czech Republic). French army (73,100 men) under Emperor Napoleon the First. Austrian-Russian coalition (85,700 men) under General Mikhaïl Kutuzov. French army: 1,500 killed; 7,000 injured; 1 flag. Austrian-Russian coalition: 16,000 men killed, lost or injured; 11,000 prisoners; full artillery; 45 flags. "The Battle of Austerlitz" (detail). Painted 1810 by baron François Pascal Simon Gerard. The Battle of Austerlitz has been called the "Battle of the Three Emperors" because it saw the Grande Armée confront the combined forces of the Holy Roman Emperor, Francis II (later Franz I of Austria) and Tsar Alexandre I. On the eave of the battle, the French army found itself in a difficult situation despite the initial successes of the German campaign: while the troops were far from their base, the imminent arrival of enemy reinforcements was also threatening to further aggravate the numerical and material disadvantage of the French who had to consider the possibility of Prussia re-entering the war. With these considerations in mind, the Emperor decided to bring a swift end to the campaign. He played up the precariousness of his own situation to convince the Russian commanders to attack in a place he himself had chosen and before the arrival of their reinforcements. His preparations were designed to ensure a stunning victory. He allowed the enemy to capture the Pratzen Heights stating: If I wanted to prevent the enemy from advancing I would do it here. But then I would have an ordinary battle. If, in contrast, I pull back the right flank toward Brünn and the Russians abandon the Heights, they are lost for sure. By withdrawing his right flank, Napoléon hoped to convince the enemy to turn in that direction which would allow him to break through the flank the Austro-Russians would expose as a result of this manoeuvre. This was exactly what happened the next day. The battle began at dawn around 7 a.m. The Austro-Russian troops immediately descended from the Pratzen Heights toward Telnitz in an attempt to defeat the French right flank commanded by Marshal Louis-Nicolas Davout. An hour and a half later, Napoleon ordered the assault on the abandoned Heights by Marshal Jean-de-Dieu Soult's troops, who had until then been hidden by a thick fog covering the bottom of the valley to the west of Pratzen. This manoeuvre took the enemy completely by surprise. The Heights were captured in 30 minutes. Around 9 a.m. Mikhaïl Illarionovitch Kutuzov attempted a counterattack. He ordered all of his reserves, including the Russian Imperial Guard, to retake Pratzen. But this was in vain. At 11 a.m. he ordered a retreat to Austerlitz. During this time, the centre commanded by Marshall Jean-Baptiste Bernadotte, the left flank under Marshal Jean Lannes and the cavalry under Marshal Joachim Murat joined the fightin. This bought the total to 150,000 men involved in the battle as well as several hundred cannons. Under the pressure of the French advance, the right flank of the coalition army pulled back and was not able to restore contact with their left. When the Imperial Russian cavalry overwhelmed a French battalion, Marshal Jean-Baptiste Bessières's cavalry was quick to respond. Around 1 p.m., the Austro-Russian retreat deteriorated into chaos. Their left flank, caught between Davout to the north and Soult to the south, was annihilated as they tried to escape across the frozen ponds around Telnitz. Thousands of men drowned as the ice across which they were trying to retreat was broken by French bullets. After nine hours of combat in a battlefield measuring twelve kilometres by eight, the French were declared victorious. Kutuzov was left to organize the retreat of the Russian army and their return, via Hungary and Galicia, to Russia. Starting on December 4, Napoleon I and Franz II met near Austerlitz and agreed to an armistice. On December 26, Austria signed the Treaty of Presburg (today known as Bratislava) which reduced its possessions and required the payment of substantial damages. The Holy Empire loses 4 million subjects and must pay a war indemnity of 40 millions francs. It gives Dalmatia, Istria, Friuli and Veneto to the Kingdom of Italy. Tyrol, Vorarlberg and Swabia are given to the Elector of Bavaria and the Elector of Württemberg, both of which accessing to the royal dignity. The Third Coalition was finished: England, absent from the battle, found herself alone against Napoleon. 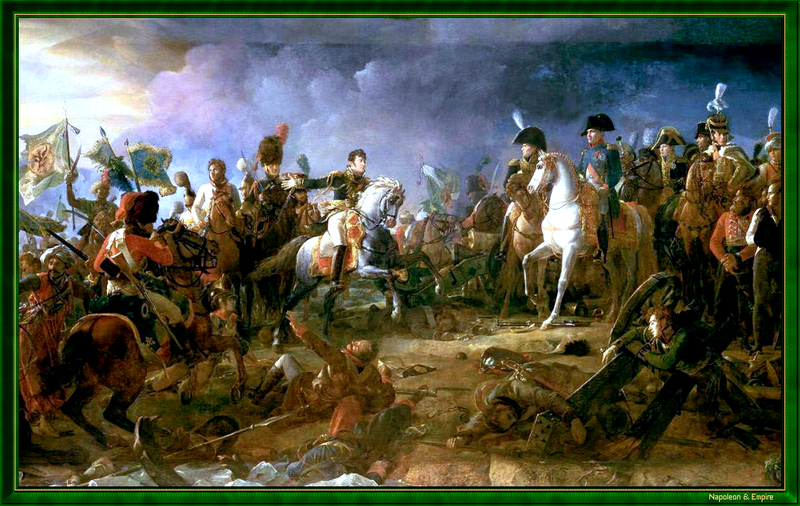 Austerlitz is considered Napoleon's tactical chef d'oeuvre as the only battle where he was able to choose the location and impose his plan on the enemy in the field. Battlefield of Austerlitz seen from the Zuran mound then from the place called «The three Emperors».